The one thing that spending hours on the road driving gives you is plenty of time to think. 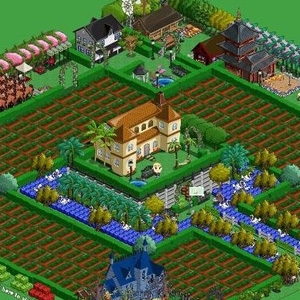 Without fail, if I have any kind of trip going on where I'm spending an entire day travelling, my mind drifts into thinking about Farmville. I know what you're thinking. Of all of the things I could think about, my brain chooses to think about a meaningless Facebook game. My question to you though, is it really meaningless? Let's stop and think about this game. In the basest of senses, it's just a way to waste time that we could spend doing other things. However, let's take things up a notch. What does the average farmer do on a stop in this game? 1. He plants and harvests crops in the hopes of completing missions or obtaining a part that he needs. 2. He travels from farm to farm. I believe, with the inclusion of Haunted Hollow, that there are now 6 different areas. 3. He travels to his friends farms and helps them out. 4. He works hard in the hopes of improving his own farm. 5. He relocates and reorganizes things in the hopes of fitting just one more thing into the space he has. When I look at the game (and yes, I do play it), I sometimes actually wish I were more like my little farmer girl. She goes in and does what she needs to do and then she moves on. Over the course of playing this game, I've developed a system to get everything done and then exit the game. So, my little farmer girl is efficient. Not only is she efficient, but she's worked for everything that she has in the game. She works hard planting thousands of crops and she always has a smile on her face. Her life isn't easy but she never gives up and she never loses her optimistic grin. She's always willing to help people out. She may not even know them but if they need something that she can give, she jumps right in. Yes, I want to be more like her and the reality is that we can all be more like her. We may not be planting crops, but every day we sow seeds. When we smile, we're sowing the seeds of joy and happiness. Very few of us sit at home all day long. We're a society of movers and travelers and when we go, we take those seeds with us. How many of us have discovered that a simple smile can change someone's day? I know that I've had more than one waitress, check out person or just person I've bumped into thank me for having a smile and a kind word or two for them. Positivity can change lives. So can hard work. My little farmer girl busts her tush from the moment I load the game to the moment that I head back to my Facebook feed. She plants and harvests and feeds animals and does what she needs to do to grow her farm. I'm pretty sure that she looks upon every land expansion as a reward for what she's done. Hard work isn't a foreign concept to most of us. Yes, there are people out there who have had everything handed to them and there are some people who have had nothing handed to them. Most of us fall somewhere in the middle of that range, but we've learned that if we want a newer car or a nicer house, we're going to have to work for those things. Heck, how many of us have woken up in the morning and thought, "Man, can't the house clean itself today?" Wishes are nice, but they're not going to get us anywhere near what we can do if we work at it. Let's face it. Our homes didn't get messy, our bodies didn't get chunky and our brains didn't get filled with negative thoughts overnight. The opposite isn't going to happen overnight either. Don't get me wrong. I would absolutely love to wake up one morning to a television show level of clean (think any kitchen you see on Food Network), a size 12 (yes, I'm a realist.) wardrobe that fit like a dream and depression banished forever. It's just not going to happen. If I want those things, I have to get up each morning ready to work for them. It won't happen overnight. In the case of my weight, it will probably take years. In the case of my home, to get it how I want it might take the next year. As for the mental attitude, there will be days when it comes easy and days when my brain chemicals are threatening to drive me insane. However, just like my little farmer girl, I can do this and so can you. Know that you can do this. If it's important to you, you will make the time and the effort and you can get it done. It's when it's not that important that we make excuses. So, decide today what it is that you want to do with your life and just do it. So what if it takes days, weeks, months or even years. What matters is that you're doing it, one step at a time. Have faith in yourself and before you know it, you'll be just like our little farmer girl, happily setting an upgraded life up on her property. That is a very interesting analogy! You are very right with this entire post, but what stuck out to me was the image at the end. It's exactly what I needed to hear today with some things I'm trying to do for me for healthy purposes. Thank you! I'm with Lydia – that pic at the end was just what I needed to see! 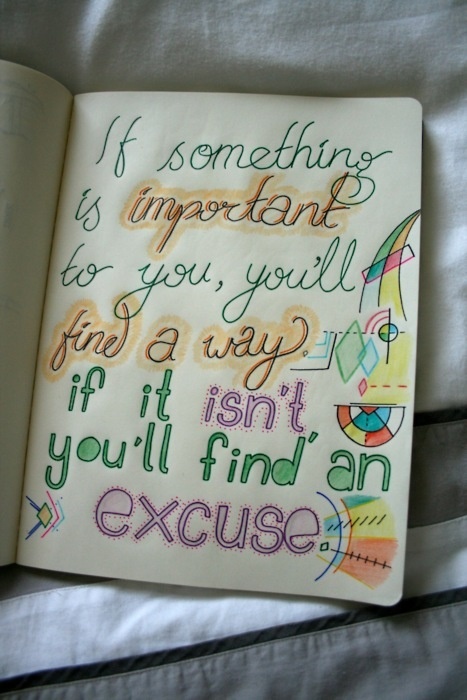 "If something is important to you, you'll find a way. If it isn't, you'll find an excuse."